US scientists have made nano-scale devices they claim could one day replace current transistor technology. The tiny devices, "crossbar latches", are made up of a combination of crossed-over platinum wires with steric acid molecules set at their junctions. The Hewlett Packard researchers said they could potentially do a better job than present transistors, dramatically improving the performance of computers. The HP team reports its findings in the Journal of Applied Physics. Transistors are the switches that make electronics work, and have always been considered the primary building blocks of computers. Today, the fine control of silicon allows millions of transistors to be fitted on to a chip no bigger than a fingernail - but this technology is reaching its limits. The research from the scientists at HP Labs' Quantum Science Research (QSR) Unit offers crossbar latches as an alternative. "We are reinventing the computer at the molecular scale," said Stan Williams, one of the researchers based at HP's labs in Paolo Alto. "The crossbar latch provides a key element needed for building a computer using nanometre-sized devices that are relatively inexpensive and easy to build." Professor Philip Moriarty, nanoscience expert at the University of Nottingham, UK, told the BBC News website that it was "extremely interesting research" and that it was quite a leap forward in molecular electronics. "HP's attempts are the best to date in trying to come up with a plausible architecture for molecular electronics," he added. He added: "The important thing is when they combine this with diodes or resistors, they can, in principle, do universal computing which means they can in theory implement any computer algorithm," he said. The wire grid that makes up crossbar latches is criss-crossed - where two wires cross, there is a switch. Like a standard transistor, the structure can manipulate an electrical signal that passes through the crossbar latch. Conventional transistors rely on the semi-conducting characteristics of silicon, which provide the switches that control the flow of current in a circuit. The tiniest features of transistors that are based on silicon now are about 90 nanometres (billionths of a metre) in size. That is about 100,000 smaller than the width of human hair. But the crossbar latch method works in a space of about two to three nanometres. This means it can work at much smaller scales and perform more functions. The sticking points for the technology which have to be worked out are the lifetime of the devices, and their switching speed. Currently, the devices only work for hundreds of computing cycles, and switching speed is many thousands of times slower than silicon technology, comments Professor Moriarty. The current method for making faster silicon chips is expected to reach a technical dead-end in about a decade. 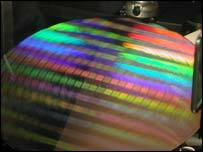 This process relies on laser light to etch a circuit layout on to silicon wafers. Chemical washes then cut out spaces according to this template, making channels that will be filled to make the circuit features - transistors, and the like. But this lithographic approach will find it increasingly difficult to focus the laser light at ever smaller small scales. At the end of 2003, IBM demonstrated its alternative method for microchip fabrication which used polymer molecules that naturally arranged themselves into hexagonal patterns. 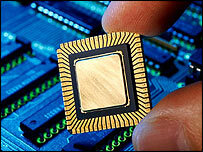 Other firms and research labs worldwide have also been looking at novel ways to fit more features on to computer chips. Some have considered building the transistors themselves at the molecular level, but this is a much bigger challenge for physicists. "As we continue to shrink silicon down, we will a reach point where an effect called tunnelling happens, where instead of controlling where electrons sit, they will tunnel through any barrier," explained Professor Moriarty. The size barrier can be overcome through molecular electronics. The HP researchers said that their technology was still some way off in terms of widespread use and would not be commercially viable until about 2012. For now, they hope to be able to glue lots of crossbar latches together so that multiple functions can be performed. But this kind of technology would eventually replace transistors, just as they replaced vacuum tubes and vacuum tubes replaced electromagnetic relays, said the HP team.